“The debate between those communities has drawn significant regional and national attention to our city, and has promoted divisiveness among our own residents. While this debate has a place in public dialogue, it has detracted from our city’s original intent of designating a space solely for the purpose of honoring and memorializing military veterans, and has also portrayed our city in a negative light,” they outlined. 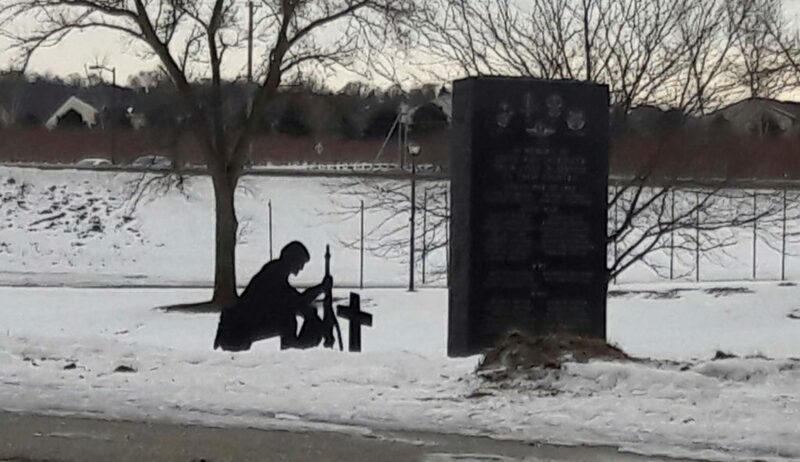 As previously reported, the situation began last year after the Belle Plaine Veterans Club placed a memorial in the park that featured a soldier kneeling before a cross tombstone, such as are seen in some military cemeteries. The display was erected next to an inscribed stone honoring local residents who had lost their lives in various wars, from the Indian War of 1862 to the Korean and Vietnam Wars. The Wisconsin-based Freedom From Religion Foundation (FFRF) contended that the inclusion of the cross in the display promoted Christianity and failed to represent other religions or those who reject religion. It asserted that even though the purpose of the display was not meant to be religious, the cross grave marker made it so, and asked that the symbol be removed since its placement on city property could be construed as government endorsement. City council met over the matter in January, and members of the Belle Plaine Veterans Club reluctantly agreed to cut the cross off the display. But as the move greatly disturbed area residents, city council members voted in February to create a “limited public forum/free speech zone” in Veterans Park to solve the issue. “[The limited public forum] ensures that there is no endorsement of religion by the city whatsoever because the memorials that will be put up represent the citizens that put them up,” Alliance Defending Freedom’s (ADF) Doug Wardlow explained. The grave marker was then welded back onto the monument and returned to the park. However, seeing an opportunity, the Satanic Temple soon applied to have its monument placed in the park, and city officials said they had to allow it because of the forum status. “It’s certainly better to preserve the First Amendment than to preserve your notions of religious supremacy on public grounds. That’s certainly not what America was founded on and certainly not what our soldiers fought for,” Satanic Temple leader Doug Mesner, who goes by the name Lucien Greaves, told the Star Tribune. Word that Belle Plaine would have a Satanic monument in Veterans Park upset some residents, and the City was flooded with calls and emails. Council member Cary Coop told the Shakopee Valley News that the City received approximately 200 calls and emails daily. On Saturday, over 100 people from across the nation protested against the allowance of the Satanic display, with most participating in the “rosary rally” organized by the Roman Catholic organization America Needs Fatima. While the Satanic monument was never installed, the silhouette of a soldier kneeling before a cross grave maker has now also been removed. Council members officially voted on Monday without comment or discussion to nix the free speech zone. The former free speech zone will now remain empty, with the exception of the American flag.